The recreational opportunities listed on the webpage for Sand Lake are brought to you by wwww.clamdigging.info for the benefit of the members of the Clam Digging and Crabbing Community. Sand Lake: Do not attempt to cross the bar at Sand Lake. Avoid boating in the lower reach of Sand Lake during the outgoing tide. Sand Lake is one of the gems of the Three Capes Scenic Loop. The natural wonder of the tidal basin is its most outstanding attribute. The fishing and crabbing is consistent because rainfall has little effect on the salinity of the water because the basin does not have a large continuous source of freshwater. The presence of perch, flounder and crabs in Sand Lake is governed by the tides. The bar at Sand Lake is too dangerous to attempt to cross. Access is gained to Sand Lake by turning west onto the Whelan Park Road at actual highway mile 8.4 on Sand Lake Road. The county park is a full service park. It is wonderful place for a family vacation. The north spit of Sand Lake is threatened by erosion as a large portion of the north spit has recently washed into the sea. Motor vehicles are allowed in most areas of the area beaches from Nestucca Bay to Sand Lake. Check with local State Park officials for areas of the beach open to motor vehicles and seasonal closures. The County Park is open for camping. For the latest information call the Camp Host at 503 965 6085. The campground is scheduled to close on 12/01. Sand Lake crabbing ranges from slow to fair to good for most of the year inside the entrance to the tidal basin south and to the west of Whalen Island. Crabs are taken by crabbers from the bridge to Whalen Island on the incoming tide. The crabbing is consistent because rainfall has little effect on the salinity of the water because the basin does not have a large continuous source of freshwater. 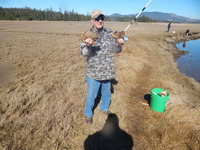 On 03/11 My friend Walter shows off two of the three Dungeness crabs caught at Sand Lake. We crabbed with 3 Crab Max crab traps for about an hour and a half prior to high slack. The crabber in the background caught 1 keeper Dungeness crab using a Crab Hawk. Click on the image to enlarge it. On 04/28/16 No crabbers were crabbing. Conclusion: crabbing is slow. On 04/13/15 clam digger Don and family report: We decided on Saturday to run to Sand Lake to try our hand at purple varnish clams and did quite well. We walked away with about 2-3 limits of clams. The clam size was small to medium with a lot of very young dime sized clams that we left for next time. Plenty of fun for everyone. On 01/10/15 I stopped by Sand Lake on my way home from Tillamook via Netarts and spoke to 3 guys putting their boat on their trailer at the boat ramp to see how they did crabbing and they said the crabbing was slow. On 08/28/14 I spoke to 2 crabbers loading up the boat at the boat ramp and they said the crabbing was fair, whatever that means. I take their comments to mean they were going home crabby. The launch conditions at Sand Lake are way bad and in serious need of improvement. Primitive boat ramp and the parking area flood at high tide. The signage warning boaters of the flooding was placed there in response to our request and the good work of Tillamook County Commissioner, Tim Josi. On 08/19/14 Caught loads of crab in a couple of hours at the day use area two hours into the incoming tide. A couple of females were pushing 7 inches, and I kept 11 nice full mails, two in a Danielson square trap and the rest on homemade snares and crab hawks. Got two good dinners for two and a quart of picked meat for freezing. Actually threw back 4-5 keepers when I caught bigger ones. Completely filled a 5 gallon HD bucket. On 05/19/14 Crabbers were doing poorly crabbing from the now 1 lane bridge to Whalen Island. On 05/19/14 My clam digging buddy Walt and I toured the tidal flats of Sand Lake digging many holes as we went not finding any clams keeper size clams. On 11/03/13 My friends Gary and Jan took 5 nice rock hard Dungrness crabs from the entrance to Sand Lake during the last series of Neap tides one hour prior to low tide usning their Crab Max crab traps. On 07/11/13 At our request the boat launch at Sand Lake now has a sign warning boaters and well as other users of the parking area that the area floods on the incoming tide. Thank's to Tillamook County Commissioner and clam digger, Tim Josi. On 06/05/11 1 boat, 3 crab pot = 6 Dungeness crabs taken at the bridge to Whalen Island with no other crabbers in sight. Granted a catch of 6 crabs for 3 crab pots is not a lot of crabs, but the catch is a lot better than it has been in some other of Oregon's other bays. Sand Lake clam digging is limited to purple varnish clams and a small population of cockles. Raking for cockles in the cockle beds located in the south channel has declined, but the purple varnish clams in the tidal flats associated with the north channel are not as abundant as they once were. The tidal flats are dominted by small clams. We suggest raking cockles at Netarts Bay rather than Sand Lake. The Sand Lake Recreational Area is a multifunctional use area for off road vehicle use, hiking, fishing, crabbing and clam digging. The Sandlake Recreation Area on the north shore is popular and busy with off-highway vehicles especially on weekends. There are 3 developed campgrounds: Sandbeach (101 sites), East Dunes (51 sites), and West Winds (20 sites). Day use parking at North Winds. NOAA tidal projections for Sand Lake. We use the tidal projections at the at the entrance of Nestucca Bay to estimate the tidal projections for Sand Lake. Click on the following link to view the NOAA tidal projections for the Nestucca River. Redtail surfperch, pileperch, walleye surfperch, silver surfperch and striped seaperch enter the tidal basin in small numbers throughout the year. They enter the tidal basin with the tide feeding heavily on intertidal animals. Fishing is usually fair depending on the tide, time of year and the weather conditions. The best fishing for perch and all species occurs from May through October during the incoming tide in the deepwater channels adjacent to the tidal flats in the lower part of the tidal basin south and west of Whalen Island. Chinook salmon stray into Sand Lake in small numbers and several are caught in the tidal basin each year. Cutthroat trout return to Sand Creek from late July into September but the greatest numbers return in August. Fish in Sand Lake during the incoming tide trolling Doc Shelton spinners rigged with night crawlers. Coho salmon are occasionally are caught in Sand Lake. The Sand Lake County Park at Whalen Island is where the crabbers, clam diggers and fishermen camp. The county park at Whelan Island is closed for camping from December 1st to May 1st but is open on the honor payment system in the open area next the boat launch. For the latest information call the Camp Host at 503 965 6085. 8.4 north 25.9 south Sand Lake is one of the gems of the Three Capes Scenic Loop. 3.8 north 34.1 south – Cape Kiwanda is located 1.2 miles north of Pacific City. From the south turn left from Brooten Road onto Pacific Ave and right onto Kiwanda Drive after crossing the Nestucca River. From the north turn right onto Hungry Harbor Dr. from Kiwanda Drive. The fishing is excellent for all species at Cape Kiwanda. Cape Kiwanda provides boats protection from northwesterly winds that predominate during the summer months. Anglers use to crowd onto the steep sided sandstone cliffs, but now, private development on the Cape prevents access. Refer to the Oregon Sport Fishing Regulation restricting the taking of shellfish within the Cape Kiwanda Marine Garden. There is ample parking at the beach access site of Pacific City’s famous Oregon dory fleet on Kiwanda Beach. Click on image to enlarge it. Kiwanda Beach extends from the Nestucca Bay sand spit on the north shore of Nestucca Bay to Cape Kiwanda. The fishing for redtail surfperch is excellent from late spring through summer. Access to Kiwanda Beach gained through Pacific City. Drive to Pacific City from the north via Three Capes Scenic Loop on Kiwanda Drive and from the south by exiting Highway 101 at milepost 90.4 onto Brooten Road. Drive to Pacific City turn left at Pacific Ave. Cross the Nestucca River and turn left onto Sunset Dr. and follow the signs 0.5 miles to Bob Straub State Park Wayside. The wayside is a day use park with ample parking for all vehicles.